For guitarists seeking to capture a colossal range of gig-friendly amp tones on a budget, the Preamp Live is a no-brainer. Tone capture feature is impressive. Perhaps not quite as detailed as more expensive modellers... but there's not much in it. Amp modelling has truly come of age, but the problem for many is the price. It was a breath of fresh air, then, when Chinese effects underdog Mooer launched its Micro Preamps last year, serving up a variety of individual modelled preamps for £99 apiece. Now, it’s packaged the whole lot together in one gig-friendly unit that might just revolutionise your rig: meet the Preamp Live. It’s certainly got the specs. Up to 12 preamps can be stored onboard Mooer’s flagship preamp, from a choice of 50 from the company’s computer and mobile apps, with four accessible at any time via the footswitches - those 12 are organised into three banks of four (ABC), switched by pressing the two footswitches either side of the respective letter on the chassis. There’s also a dual-position booster, plus pre- and post-noise gates, as well as the ability to load custom Impulse Responses for ultra-convincing mic’d cab tones of your choice. You can use the pedal with your own amp’s preamp, too, by employing the four-cable method via the Preamp Live’s onboard effects loop. There’s also a built-in Tone Capture feature that matches the EQ from your own amp’s preamp. You’ll want to run this baby into a power amp or the effects return of your existing amp. Get your rig set up right, and the sounds are certainly impressive. Just about every tone is catered for, from extreme 5150-esque metal to boutique Two-Rock-ish blues. We’re particularly fond of the higher-gain yet fizz-free Marshall and Friedman-style voices, while the cleaner Vox and Mesa sounds are wonderfully glassy and touch-responsive. The mid-gain tones perhaps aren’t quite as detailed as other modellers, but the easily footswitched pre or post boost offers dynamic flexibility. There’s a bit of a learning curve to using the Preamp Live, but tweaking presets is quick and intuitive. And the iOS/Android app is one of the most immediate we’ve used on any piece of gear; loading up new models and tweaking settings is instantaneous. The Tone Capture facility is impressive: the Preamp Live nailed the EQ frequencies of our office Blackstar HT60’s gain channel. 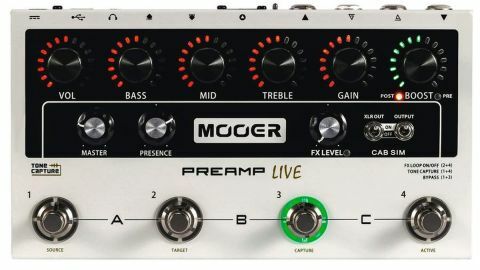 With the prospect of updatable models, Mooer has put together an enticing package, especially with street prices around the sub-$399/£350 mark, which puts this a couple of hundred below the HeadRush Gigboard and Line 6 HX Stomp, and in the region of the Atomic Ampli-Firebox.